Xencor’s CEO describes his company’s efforts to improve antibody technology, including using bispecific antibodies as a method of cancer immunotherapy. The Cancer Immunotherapy ETF (Nasdaq: CNCR) was designed to invest in new technologies that aim to move cancer care forward. (See a list of CNCR’s current holdings). While there has been real progress in the treatment of some cancers over previous decades, we are not fans of the status quo. Our goal is to invest in the new, not the old. That’s why we are proud to support innovative companies like Xencor that are on the cutting edge of using advances in science to reimagine how traditional therapies like antibodies can be used to harness the immune system against cancer. Using antibodies against diseases like cancer has been one of the biotechnology industry’s most important successes over the previous decades. In a way, they were a foundation of immunotherapy. An antibody is a protein that recognizes a marker (antigen) on a target like a pathogen or cell and attaches to it. Once attached to the marker, they either signal for other cells of the immune system to attack what they have attached to or interfere on their own with important regulatory pathways. The first antibody treatment for cancer, rituximab, was approved in 1997 and since then many others have been approved for various types of the disease. While antibody treatments are quite effective against some cancers, there is growing optimism that this can be taken to another level. An example is the emerging field of bispecific antibodies. The idea behind bispecific antibodies is simple: one arm of the antibody recognizes a marker (antigen) on the outside of an immune cell and another arm recognizes a marker on the outside of a cancer cell, and this dual recognition brings them together so the immune cell can kill the cancer cell. However, the technology behind making this happen is far from simple. Innovative companies like Xencor have been working on the science behind it for years and are just now brining this advance into clinical trials for patients. To learn more about the innovative work taking place in the antibody field and how this might impact cancer immunotherapy, we posed a handful of questions to Xencor’s President and CEO, Bassil Dahiyat, Ph.D. Having founded Xencor in the late 1990’s, Dr. Dahiyat is a leading expert in the field who has guided his company to the forefront of antibody science. He provided written answers to our questions that we hope will educate readers on the basic science that has brought the company to this point, why Xencor’s technology platform could be a improvement over traditional antibody treatments, and how their bispecific antibodies are being tested in trials against cancers. You have based your company on the XmAb antibody engineering platform. What is that and what advantages does it have compared to how traditional antibodies are designed? Antibody therapeutics have been hugely successful for their ability to precisely bind to, block or eliminate molecules that cause or regulate disease. However, the vast majority of research into new monoclonal antibodies has been focused on improving how antibodies bind to their target by modifying the tips of the Y shaped antibody, called the Fv domains. It turns out that a tremendous amount of antibody function is controlled by the stem of the Y shaped antibody, called the Fc domain. 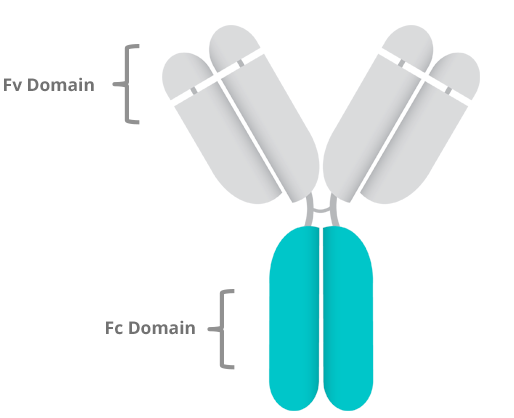 Fc domains provide the very stable scaffold for antibody structure, maintain the long circulating half-life of antibodies and engage with a variety of immune cells to control antibody immune function. Our XmAb technology consists of a set of small and precise changes to this stem of an antibody, resulting in our suite of engineered Fc domains that significantly enhance antibody function. These XmAb Fc domains can enhance cell killing ability of the antibody, extend the life of the antibody in circulation, modulate immune response, or enable simultaneous binding to different disease targets. We simply select the appropriate Fc domain for swapping into an antibody to provide the selected enhanced functions. We have developed a leading position around modifications to the Fc domain of the antibody, and we have leveraged this to develop a broad portfolio of drugs in development. The technology is extremely flexible – XmAb Fcs can plug-and-play into nearly any antibody. And because XmAb drug candidates are typically more than 99.5 percent identical in structure and sequence to natural antibodies, they behave like natural antibodies – they are stable both in storage and in the circulation, and are simple to produce. 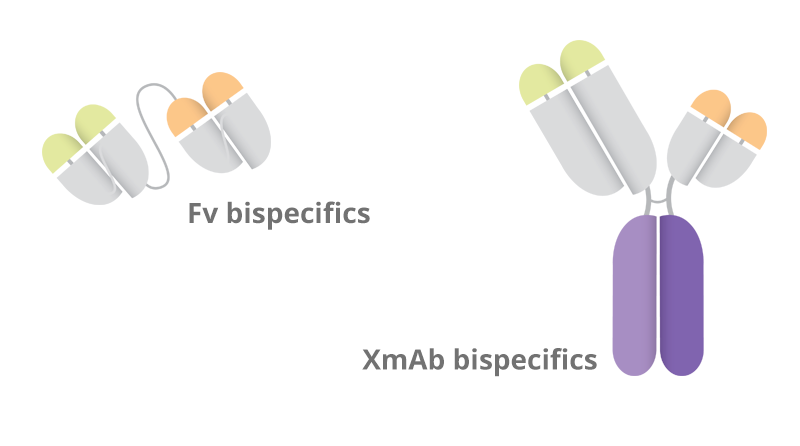 We have created four primary types of XmAb Fc domains, each enhancing a key property for antibody therapeutics: our Bispecific, Immune Inhibitor, Cytotoxic and Xtend Fc domains. Many of your cancer programs utilize bispecific antibodies. What is a bispecific antibody, and why are companies like Xencor using that approach in cancer immunotherapy? Unlike traditional monoclonal antibodies that bind to just one antigen target, a bispecific antibody is an antibody that is designed to target and latch onto two different antigen targets simultaneously. This is particularly useful when you want to engage a killer T-cell to a tumor cell, for example. We believe bispecific antibodies are a powerful approach in the field of cancer immunotherapy to modulate the immune system to safely attack tumor cells – all while using an antibody therapeutic modality that drug developers and physicians have become familiar with. Traditional monoclonal antibodies were developed and first approved in the 1980’s. Why has it taken so long to develop bispecific antibodies? Bispecific technology is really only possible with the latest advances in bioengineering because antibodies do not naturally bind to two targets simultaneously. The idea has been around for decades but early efforts to put two different antigen-binding regions on to one antibody were frustrated by poor molecular stability, difficulties in production and short in vivo half-life. The first bispecific approved by the FDA in 2014 (Amgen’s BLINCYTO) attempted to address some of these challenges by completely removing the Fc region in an effort to link two Fv binding regions together. But as you would expect, that technology has limited potential due to losing the stability and long circulating half-life that Fc domains give antibodies. 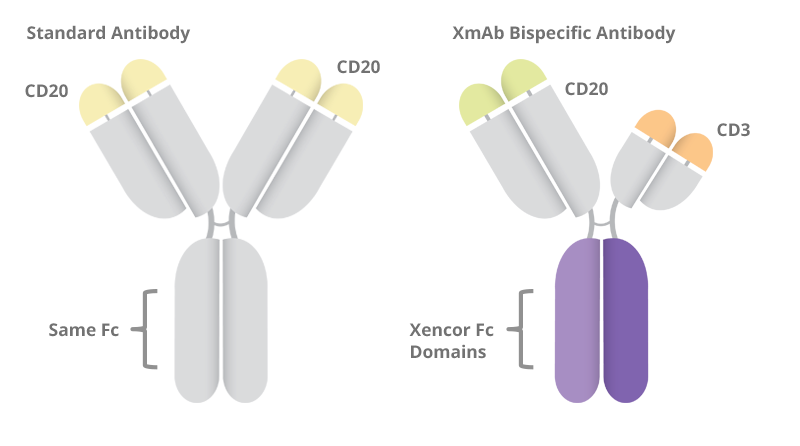 At Xencor, our bispecific Fc domain technology maintains full-length antibody properties in a bispecific antibody and can be made and purified with standard antibody production methods. What kinds of cancer are you targeting? Xencor has two bispecific programs in the clinic right now with the focus on directing an immune response against cancer targets. One of those programs is XmAb14045, which binds to CD3 expressing immune cells to activate an immune response, while simultaneously binding to an antigen called CD123 which is highly prevalent in acute myeloid leukemia (AML) cancer cells. The other is XmAb13676 and acts in a similar fashion by binding CD3 and CD20 to direct an immune response against chronic lymphocytic leukemia (CLL) and non-Hodgkin lymphoma (NHL) cancer cells that overexpress CD20. We also have XmAb18087 in pre-clinical development for the treatment of neuroendocrine tumors, and XmAb20717 in pre-clinical development for the treatment of multiple cancers. What clinical trials do you currently have open in cancer? Are any other trials or milestones expected to occur later this year? 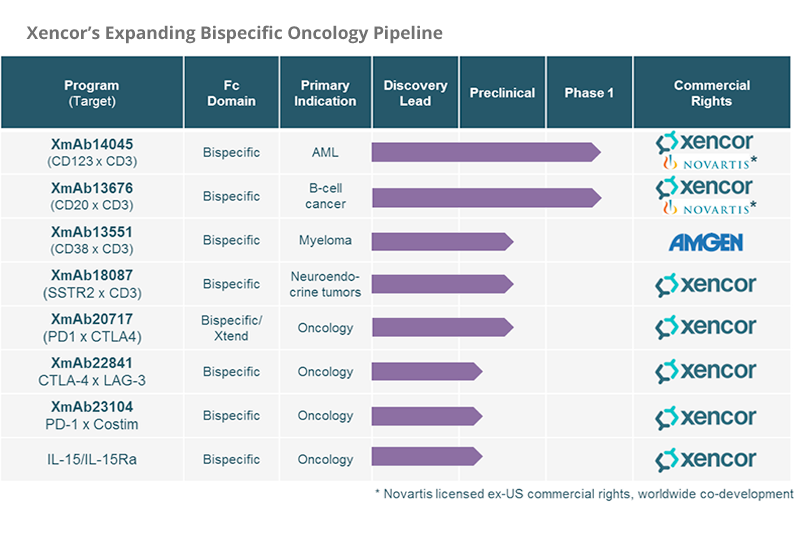 The recent success with our bispecific technology has really fueled our oncology pipeline. XmAb14045 is in a Phase 1 clinical trial for the treatment of AML, and we started the trial in September of 2016. XmAb13676 entered into a Phase 1 clinical trial for NHL earlier this year. We plan on filing an Investigational New Drug application for XmAb18087 for the treatment of neuroendocrine tumors in 2017. Our partners CSL (a global biopharmaceutical company based in Australia) and Janssen (Johnson & Johnson’s pharmaceutical division) are developing an XmAb antibody called talacotuzumab currently in Phase 3 development as a treatment for leukemia. Our partner Morphosys is developing an XmAb antibody called MOR208 that has started Phase 3 development in CLL and NHL. What are your company’s goals over the next couple of years? We are going to continue to explore the potential of XmAb antibodies in various clinical development programs, with an increasing focus on oncology in addition to autoimmune diseases and allergic diseases. Our most advanced program, XmAb5871, is in Phase 2 development for a newly defined disease called IgG4-Related Disease. In Phase 1 is XmAb7195, which has a differentiated mechanism for treating asthma compared to existing antibody therapeutic Xolair. I already mentioned the various combinations and disease indications are targeting with our bispecifics platform. We have a tremendous amount of opportunities, which really highlights the power and flexibility of our technology. What are some noteworthy partnerships Xencor has made? 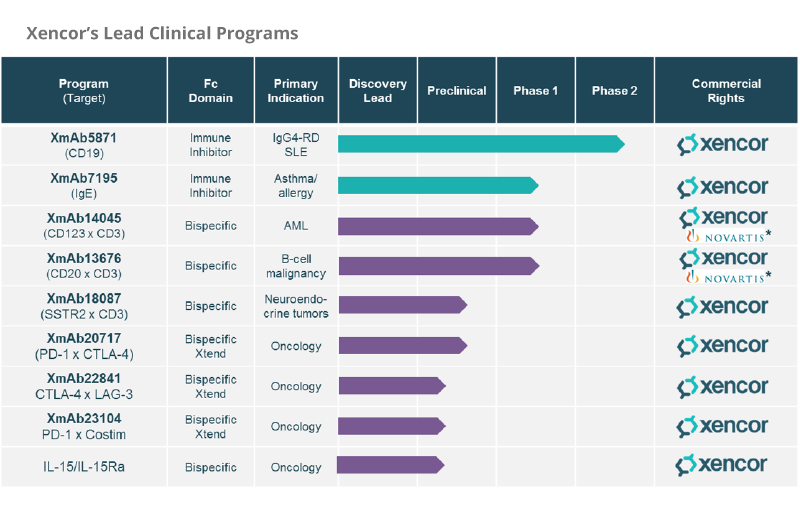 The plug-and-play nature of our XmAb domains has created a large number of drug development opportunities, and partnering has been a key strategy for generating value from non-core assets. Our bispecific programs have been especially attractive to partners over the past couple of years. In June 2016, Novartis licensed ex-U.S. commercial rights to XmAb14045 and XmAb13676. Importantly, we kept U.S. rights. Novartis also received rights to use our XmAb bispecific technology for four additional programs, plus non-exclusive rights to use XmAb domains against up to 10 Novartis drug targets. We received $150 million upfront from this deal and could earn up to $2.41 billion in clinical, regulatory and sales milestones, plus royalties on sales. And in September of 2015, we entered into a partnership with Amgen where they are using XmAb Bispecific Fc domains across six programs in cancer immunotherapy and inflammation, including a CD38xCD3 bispecific antibody discovered at Xencor for myeloma. We received $45 million upfront, with potential to receive up to $1.7 billion in clinical, regulatory and sales milestones, plus royalties on sales. Currently, nine pharmaceutical companies and the National Institutes of Health are advancing novel drug candidates either discovered at Xencor or that rely on Xencor’s proprietary XmAb technology. And seven of those programs are currently undergoing clinical testing, including three programs in Phase 3 testing. Xencor has been a public company since December of 2013, but your company has been around for a much longer time. Can you tell us a little more about your history? 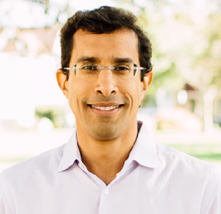 Xencor was founded in 1997 based on structural biology technology I helped develop during my doctorate program at Caltech. We had developed computational methods for designing proteins. At the time, there was nothing like it. In 2003, we focused on antibody drug design – which is the most rapidly growing field within the market for protein-based therapeutics. Since then, we have fine-tuned our technology, built our pipeline and forged a series of collaborations with partners — many of which remain partners today. Today we have 11 drugs in clinical development, XmAb technology that is fueling a deep preclinical pipeline, and major partnerships with some of the biggest players in pharma. What does support from investors mean to you? I am humbled by the support we have received from investors that want to be a part of Xencor’s journey, and I learn from them every day. The clinical development path is not an easy one, and communicating those ups and downs with shareholders can be challenging. But we’re fortunate to have had a core group of investors that appreciates the science, understands its potential, and has goals that are ultimately aligned with us – to improve the quality of lives of people with devastating diseases. Having investor support gives us the confidence to continue to pursue development of cutting edge cancer immunotherapies. I’m grateful for all of our investors and looking forward to make progress with our clinical programs. The Cancer Immunotherapy ETF is thrilled to invest in cutting edge companies like Xencor and we wish Dr. Dahiyat, his team, and their partners best of luck as they try to harness new antibody technologies to improve the lives of patients.